She is a small dog of indeterminate breed. Soft black fur, fluffy pointed ears and a deep growl that warns others away. 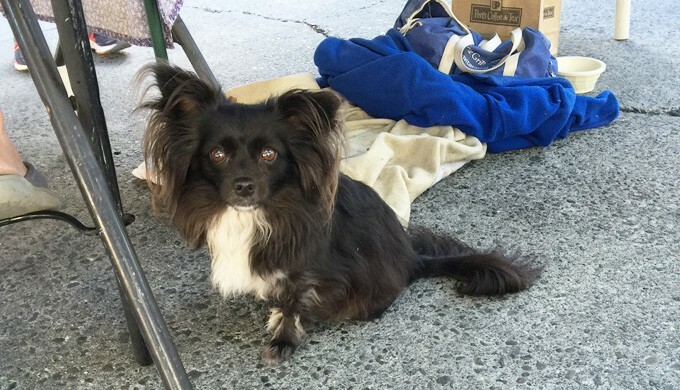 Bella belonged to migrant workers in the Capay Valley north of San Francisco. When time came for them to move on there was no place for Bella, so she was left behind. Not just left behind but picked up by the scruff of her small neck and thrown across the road. 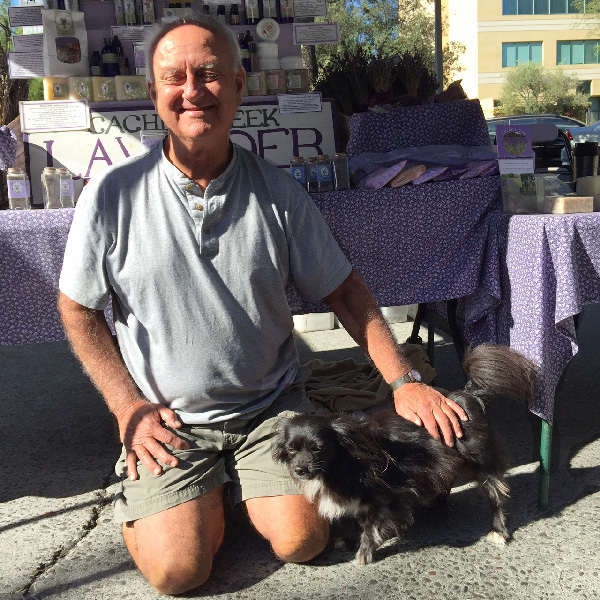 Charley found Bella and she became a part of his life, and the life of the beautiful Cache Creek Lavender Farm where Charley and Linda grow astonishing lavender. 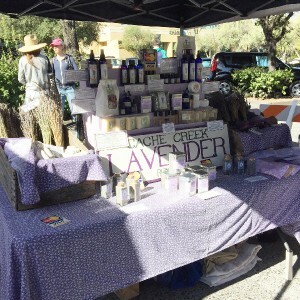 Fields and fields of lavender which they turn into a multitude of items: soaps, oils, creams sachets, bath salts, gift baskets. All of this is for sale at the little kiosk Charley and Bella set up every Saturday morning at the Downtown Palo Alto Farmers Market where we met them. Bella curls up on a little bed Charley makes for her under the table bearing his lavender. She is not a friendly little girl so no children stop to play with her as they do with the dachshunds who camp near our table. But Charley discovered that Bella loves the dog biscuits that I bring each week to our Friends of the Palo Alto Animal Shelter table. Charley said we should call it Doggie Crack because Bella loves them so much. I think my biscuits may have opened a door in Bella. Last week I offered her a little piece of biscuit and though she continued to growl softly she did allow me to scratch her under the chin. That was a special treat for me. Maybe I and my biscuits will lead her to allow me to pet or even cuddle her. But I fear her memory of the horrible abuse she suffered as a young dog is still too fresh in her mind. So she sits quietly, watches everything and doesn’t engage with children. Maybe time will change that. But when I look into this little girl’s eyes I cry for the sad life she once had. And I am so grateful for Charley and his big heart that have given Bella a safe and loving home.